Congress Should Declare Mice Are Animals -- Now! Because rats, mice and birds are not animals, their numbers are not included in the annual animal-use reports research institutions are required to submit to the Feds each year. As a result, we have had no idea how many animals are used in research in the United States. Until now. Even in animal protection circles, People for the Ethical Treatment of Animals is controversial. But whether or not you like PETA, it has been a major force in changing public attitudes about the use of animals. I have a background in animal research, and I disagree with PETA on many issues, including their call for the elimination of animal experimentation. But, in my view, the organization deserves kudos for a recent study it conducted on trends in the use research animals. The results are eye-opening. Unlike the Animal Welfare Act, the National Institutes of Health does require that institutions receiving NIH funds file periodic reports on the numbers of ALL vertebrate species involved in research. (In addition to rats, mice and birds, these include fish, amphibians and reptiles.) A group of PETA staffers used the Freedom of Information Act and state open-records laws to access these unpublished reports from institutions representing the top 25 largest recipients of NIH funds. Among the universities were Yale, Johns Hopkins, the University of Michigan, the Harvard Medical School, Duke, Vanderbilt and the University of Pennsylvania. 1. Biomedical research groups pay lip service to goal of reducing the use of animals in research, but, in reality, the number of animals used in research has gone up -- way up. Indeed, over the last 15 years, the average daily inventories of animals in the 25 institutions PETA studied increased nearly 75 percent. 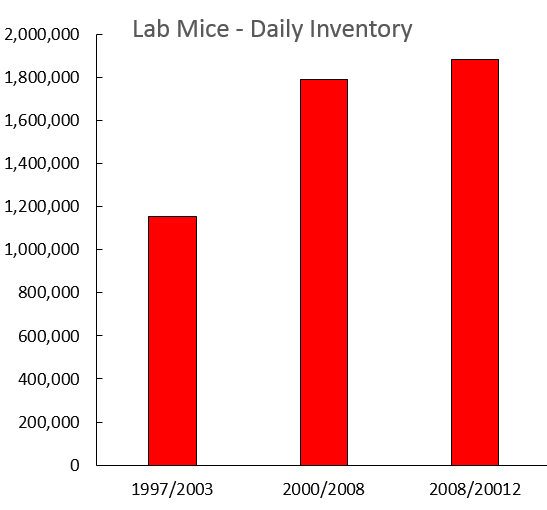 On a typical day in 2012, for example, these facilities housed 700,000 more mice than they did 15 years earlier. 2. Roughly 75 percent of animals used in research are mice and another 16 percent are fish. These are the preferred species for genetic engineering experiments. 3. While the numbers of mice and fish used in research have gone up over the past 15 years, the number of dogs has remained constant, and the use of cats has declined nearly 60 percent. 4. Most importantly, an astounding 98.8 percent of animals housed in biomedical research facilities in the United States are exempt from any coverage under the Animal Welfare Act. So...How Many Animals Are Used In Research? Estimates of the total numbers of animals used in experiments in the United States are all over the place. Research advocacy organizations typically put the number between 13 and 25 million. At the other extreme, Dr. Larry Carbone, director of the Laboratory Animal Resource Center at the University of California, San Francisco, estimates that when you include the unweaned baby rodents and animals killed without ever being used in an experiment, between 80 million and 100 million animals are housed in research facilities every year. In their article, the PETA researchers did not include a figure for overall lab animal usage. So I emailed Dr. Alka Chandna, one of the authors of the study, and asked if the team was able to estimate the total number of animals involved in research each year in the United States. Indeed they were. According to published government statistics, 1,038,976 animals in species covered by the Animal Welfare Act were used in research in 2013. But these only represent 1.2 percent total because most animals do not fall under the AWA. By extrapolating, Alka, who has a Ph.D. in applied mathematics, projected the total numbers of animals housed in labs to be roughly 86 million -- about what Larry Carbone estimates. How many animals are used in research each year in the United States -- 13 million, 25 million or 86 million? I suspect that PETA's estimate is closest to the truth. I am not an animal rights activist, and I support experimentation on non-human species. But I find the congressional declaration that rats, mice and birds are not animals to be bizarre, unnecessary, and even morally offensive. The rats/mice/birds exclusion intentionally obfuscates the true numbers of animal used in research. And, it lends credence to the claims of animal rights groups that research institutions have something to hide. The United States is the only country in which politicians have officially decreed that rats, mice and birds are not animals. Even scientists find this state of affairs embarrassing. With support from the National Science Foundation, the social psychologist Scott Plous and I conducted a survey of biomedical researchers. We found that about the bulk of scientists serving on university animal care and use oversight committees (IACUCs) want to see these creatures covered under the act (here). After all, why should Guinea pigs and hamsters housed in labs be entitled to legal standing but not mice? Here's the bottom line: It's time for Congress to amend the Animal Welfare Act and restore rats, mice and birds back to their places as rightful members of the animal kingdom. For more on ethical issues related to use of animals in research see The Animal Research Paradox. Hal Herzog is Professor of Psychology at Western Carolina University and author of Some We Love, Some We Hate, Some We Eat: Why It's So Hard To Think Straight About Animals.